Sentry ripping apart some of the Void’s demons. The Sentry was never been a particularly original superhero. He’s more or less Marvel’s answer to Superman with a healthy dose of Moon Knight’s madness thrown in for good measure. The character’s new solo series, though, is doing something much more interesting than you’d expect. 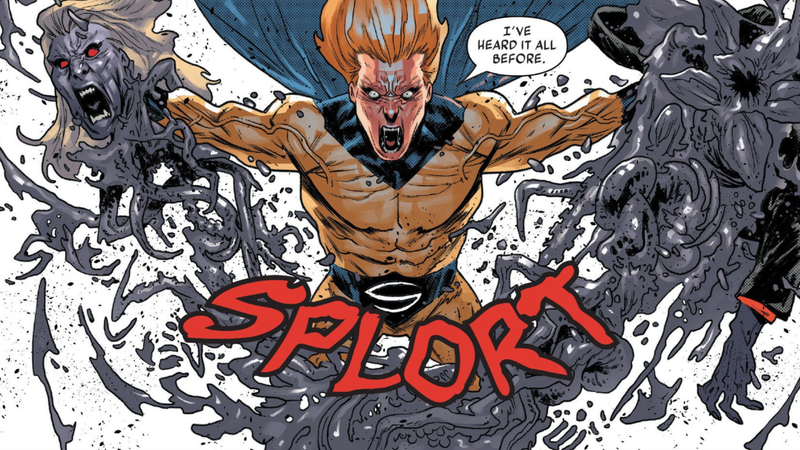 Much like the use of “fetch” as an adjective, Sentry never really took off as a character, which is telling considering that he’s been kicking around in Marvel’s books since 2000. In the original The Sentry, Robert Reynolds is introduced as a mild-mannered, middle-aged man who one day remembers that he was once the Sentry, the most powerful superhero in the entire galaxy, in the style of Golden Age superheroes just like Superman. For reasons that Robert can’t initially explain, the world has no memory of the hero, but when he realizes that his nearly all-powerful arch-nemesis the Void is returning, he sets out on a mission to restore a number of Marvel heroes’ memory of him in hopes that together they can save the world. In time, Robert’s character became much more complicated as it was revealed that the Void was in fact a part of him, his all-consuming id that would plunge the universe into darkness were it ever to go unchecked. It’s revealed that Robert, realizing the Void would exist so long as the Sentry existed, chose to have all recollection of the hero and villain erased from his own mind—but with the beginning of this new series, the two once again become embroiled in their never-ending war with one another. Reed Richards confronting Sentry about his truth in Sentry #5. At various points in the Sentry’s publication history, he’s been an Avenger, the leader of his own Shazam!-like superfamily of costume-coordinated heroes, and a man struggling to contain his split personalities. That last bit, the Sentry fighting to contain the Void, his inner darkness, is what the vast majority of comics about him have focused on—so much so that after a while, Sentry stories just stopped being fun to read. Jeff Lemire, Kim Jacinto, and Rain Beredo’s new Sentry comic opens with all of Robert’s history in mind and very much frames him as a ticking time bomb. But rather than simply having a bunch of concerned Marvel heroes convene to discuss the Void’s potential return, Sentry instead focuses on the mundaneness of Robert’s life after he figures out a way to keep his demon and his hero in check with the help of Doctor Strange. Robert’s days run like clockwork. He gets up, brushes his teeth, has his cereal, and heads to the diner where he works as a line cook alongside his longtime friend Billy, who once fought evil at his side as Scout, and Jenny, the waitress they both have a crush on. Robert’s life is normal, consistent, and uneventful, but it’s only because of a device that gives him a way of letting go of his life as Sentry. Every day, Robert sits in his bare apartment in front of a magical artifact that contains a pocket dimension where he’s able to relive his life as a superhero. As the Sentry, the Sentress (a character based on Jenny), and Watchdog (the superdog), Bob goes toe-to-toe with the Void once every few hours in order to blow off steam and unleash his powers in a place that would never allow for the Void to escape. It’s within Strange’s pocket dimension that Sentry becomes something fascinating, because it’s both a reflection on Robert’s deepest desires and commentary on the wish fulfillment fantasies that were so plainly evident in Golden Age comics. As Sentry in the pocket dimension, Robert’s dialogue shifts into an old-timey superhero voice that feels out of place in a modern comic. Sentry, Scout, Watchdog, and Sentress taking on the Void. As he and Scout and Sentress lay the hurt on the Void, they quip, make lame jokes, and ask breathless questions of one another that aren’t in the least bit rhetorical. Within the pocket dimension, they become idealized, sanitized heroes of yesteryear who always save the day—and it’s sad. It’s sad because none of it is real. After every battle as the world around them begins to reconstruct itself, Scout, Sentress, and Watchdog bid Sentry farewell and he teleports back out to return to his life as Bob—a life he hates, but knows he must maintain for the sake of the greater good. Reading Sentry, it’s impossible not to pick up on the undertones of the Golden Age that are woven all throughout. They’re celebratory of that time in comics history, but the book is also shot through with a keen kind of despair that feels like more than a man struggling to deal with his mental illness. In those moments when Robert’s in the real world, he comes across a lot like an adult Billy Batson who, after being faced with a truly insurmountable challenge, was forced to give up being Shazam. The heart and dream to be a true, classic hero are still there, but Robert knows that, as a responsible adult living in the real world, the Sentry’s a part of himself that simply can’t exist. What&apos;s the worst failed attempt to create an awesome new hero?